← Time to get nervous. In 2008, the passing duo of Jonathan Crompton and Nick Stephens looked more like they belonged in the SAC rather than the SEC. Then, presto, Jonathan Crompton has the look of a 4th round pick. Crompton improved his numbers, drastically, in every area. But, how much did he really improve against the better teams? Tennessee played 13 games last season. 10 came against BCS conference foes, including 8 conference games and non-league dalliances with UCLA and Virginia Tech. Their other 3 games came against non-BCS opponents. 2 of those came against a pair of the worst teams in IA, Western Kentucky (0-12) and Memphis (2-10). The other came against a respectable Ohio outfit (9-5). As you can see, Crompton was still pretty good against the tougher competition he faced, but a good portion of his 2009 numbers (almost half his touchdown passes) came in the 3 games when his teammates were vastly superior to his opponents. Yeah, well, unfortunately if you’re a Georgia fan, it’s worse than the tale he tells. If you yank out the stats Crompton compiled against Georgia, here’s what you’re left with versus BCS teams: 145 completions, 268 attempts, 54.1 completion percentage, 1704 yards passing, 6.36 yards per attempt, 11 TDs, 9 interceptions and a 114.34 passer rating. Not exactly what you’d call drastic improvement. A low bar for Herb Hand. Vanderbilt’s new hire, previously Tulsa’s offensive coordinator, steps into a situation where it’s almost impossible to do worse. I suspect the Commodores would happily settle for mediocre this season. Catching up to Gus? This one surprised me. … In their first 2 conference games, Auburn faced Mississippi State and Tennessee. The Tigers averaged 524 yards in those 2 games (breaking 400 both times) at a robust 6.3 yards per play. Not surprisingly, the Tigers won both those games. Over their final 6 league games, the Tigers managed to top the 400 yard barrier just once (their only win in that stretch). 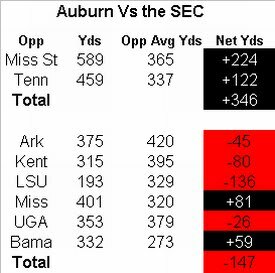 Over those 6 games, the Tigers averaged 328 yards per game at a much more meager 5.0 yards per play. of course, maybe the schedule just got a littler tougher. So let’s adjust for schedule strength. Now, take a gander at the chart below. Matt is quick to say that the data shouldn’t be construed as an indictment of Malzahn. But it sure will be interesting to see how Auburn does in his second year. Thank you, Woody McCorvey. More than anything else, Sylvester Croom isn’t a head coach any more because of his stubborn insistence that Woody McCorvey was a competent offensive coordinator. The stats tell a very different story. … Heck, since 2000, they have only scored 30 points or more 24 times (the same number of times they have been held below 10). But things could be changing. 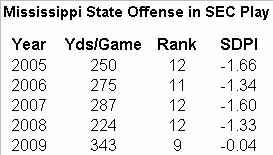 Against SEC teams, the Bulldogs posted their best recent offensive performance last season, their first under head coach Dan Mullen. The Bulldogs not only improved their offensive performance by over 100 yards per game in the league and finished outside the bottom two, but if you look at their SDPI number, they were very close to being average offensively! In terms of wins and losses, he may have had less to show for it last year than did Kiffin and Chizik, but it wouldn’t surprise me if Mullen wound up being the best of the three 2009 SEC head coaching hires when the dust settles. We were horribly confused by Crompton’s ability to jog away from the line and then hurl the ball forward like a projectile. Let’s hope Coach Grantham is more adept at defending that “roll out and throw” thingy that Tennessee invented last year. Vandy scored five TDs in all of SEC play last season, yet scored four in a single game against Georgia Tech (3 via offense, 1 via kick return).